Congratulations for making the commitment to walk a marathon. The 26.2-mile challenge requires months of training and planning. Tackle it one step at a time. Which Type of Marathon Should You Walk? There are two types of marathons for walkers. The first type is the running marathon that also allows slow runners and walkers. These are organized with runners in mind and set up according to their needs, with a closed course free of traffic. They usually are timed and present awards for overall winners and winners by age groups and categories. They may include a judged racewalking category. The second type is the true walking marathon, designed for and by walkers. It may not have timing, a closed course, or awards based on time. Top Walker-Friendly Marathons: These include running/walking races and those that are purely for walkers. How Long Will It Take You to Finish? You need to know how long it will take you to walk a marathon. That may be from six hours for a fast walker to over eight hours. You will need to know this before you start exploring which marathon to enter. Do not register for a marathon unless you know you will be able to finish within its cutoff time. You will also need to know this before you register as most races want to know your expected finish time or pace in order to place you in the right staring corral. Once you have a good idea about how long it will take you to finish, now you can start looking for walker-friendly marathons. Here is how to look for a race that will keep the course open and supported for you throughout the time you will be out walking. When and Where is the Marathon? Give yourself nine months to fully train for a marathon if your maximum walking distance is six miles or less now. If you have already walked a marathon or other endurance event, give yourself two to three months to recover fully in between. When traveling, arrive three to four days in advance to adjust to time zone, temperature, humidity and elevation. 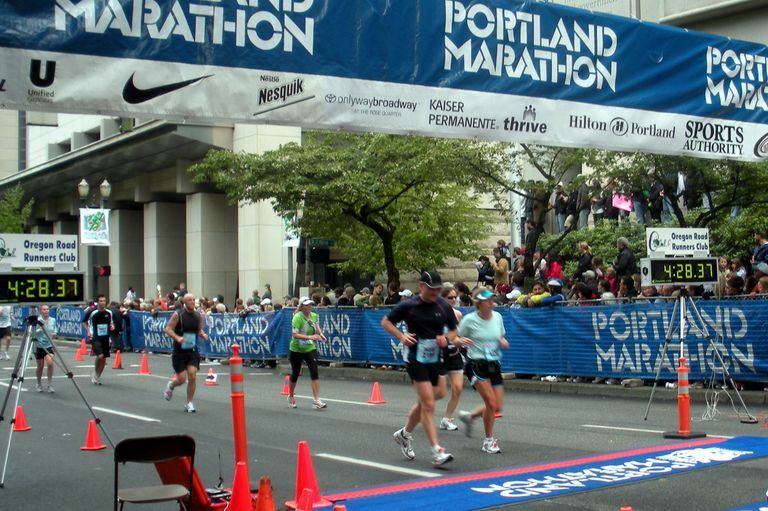 You can expect that a well-supported marathon will cost you $75 or more for registration. They will often have early registration specials and late registrations surcharges, so it pays to enter early. Very few marathons give refunds if you must cancel and most do not allow you to sell or transfer your registration to another person. Some event sell registration insurance for a few dollars that can give you a refund if you cancel due to a particular set of reasons. Some races allow you to downgrade to a shorter course, such as the half marathon or 10K if they are hosting those at the same time, or to roll it over to a future event. But for many races, if you have to drop out, you lose your money. If you transfer your entry to somebody else and it is caught, both of you may be banned from future events. Should You Walk a Charity Marathon or Not? Walkers can walk a marathon for charities such as the Leukemia Society or the Komen Foundation. The walker benefits by having a walking coach, group training walks, team support getting to and through the marathon, and motivation to carry through for their sponsors. Sometimes marathons only allow walkers if they are in a charity program. The drawback is having to raise a significant amount of money for the charity, usually over $2500. How should you train to walk a marathon? Use our complete training guide to get ready. Learn how to build your mileage, what shoes and clothes to wear, how to drink and snack on a marathon walk, and what to expect on race day.